♥ Bemini fitted sheet crib Darling 60x120cm ♥ Fast deliv..
♥ Jollein fitted sheet 60x120cm black ♥ Free shipping fr..
♥ Baby Boum fitted sheet crib Stary Ecru 60x120cm ♥ Fast..
With a fitted sheet you protect the mattress and create a comfortable sleeping place for your baby / toddler. A fitted sheet for a bedstead is standard 60 x 120 cm or 70 x 140 cm and available in different colors and fabrics. 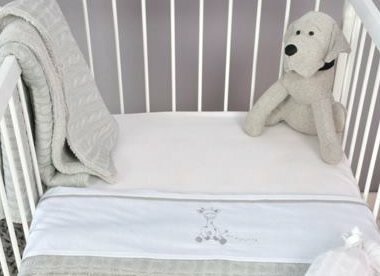 You can choose from 100% plain cotton or terry cloth. Depending on what you like and whether your baby is hot or cold quickly. Terry is often slightly warmer.